Nothing says as much as a bottle of Moet & Chandon Brut Imperial Champagne from France. Presented in a basket of Stargazers, Roses Eustomas and Barbados, this bubbly festive gift will definitely define your gifting style. 18 stalks of roses and 6 stalks of Stargazers. Champagne mentioned is available within Klang Valley. 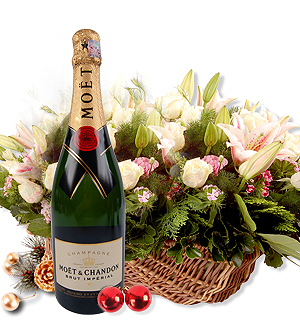 Type of champagne and flowers available may differ in other States. For delivery to other States, our Customer Service will confirm with you on the availability. Kindly contact our Customer Care at 03-78830233/+6012-6915200 or sales@gift-lab.com for further assistance.